Take a look at your calendar, and you probably will not find Planning Day as a listed holiday. Planning Day, held on October 15th this year, is an annual event observed exclusively by the Department of City Planning (DCP) where DCP staff lead and participate in multiple tours designed to explore different planning-related themes throughout Los Angeles . For this year’s Planning Day, a group of DCP staff biked the streets of Downtown Los Angeles (DTLA), Little Tokyo, and the Arts District to see first-hand how LADOT is helping transform Los Angeles into a vision of Complete Streets. LADOT People St guru Elizabeth Gallardo rallies DCP staff for our tour. To kickoff the tour, LADOT People St Project Manager, Elizabeth Gallardo lead DCP staff along a greatest hits of active transportation projects designed by LADOT to serve a broad cross section of road users, who find DTLA as a vibrant place to live and spend their leisure time. First stop was the Spring Street parklets where Nicholas Ziff Griffin, Director of Economic Development at the Downtown Center Business Improvement District described the importance of these amenities in creating a vital place where people want to linger and explore new businesses. Bicycle Friendly Business Peddler’s Creamery offers sweet rewards for customers that churn ice cream using pedal power. Our mobility future is upon us! Plan for 2035! Exciting things keep happening for the future of mobility in Los Angeles! Some of you who have been following mobility planning and implementation in the City may be wondering when Mobility Plan 2035, the primary planning document that guides planning and implementation of mobility for the City, could take effect. Well you are in luck! On Tuesday, August 4th, the LA City Council Transportation and Planning and Land Use Management Committees will consider the decision to adopt the Plan at 2:30pm in Council Chambers. If urban planning and government are not your profession, you might be wondering what a plan is, why we use them, or how you can learn more. Planning documents are developed (this one has been in development for nearly 4 years!) with an extensive process of outreach, studies, socio-economic forecasting, visioning, and strategic planning in order to guide unified decision making in the future. Plans are not set in stone, but they provide goals (aspirations in vision) and objectives (ways of achieving the vision) that the City can pursue to achieve a desired future. 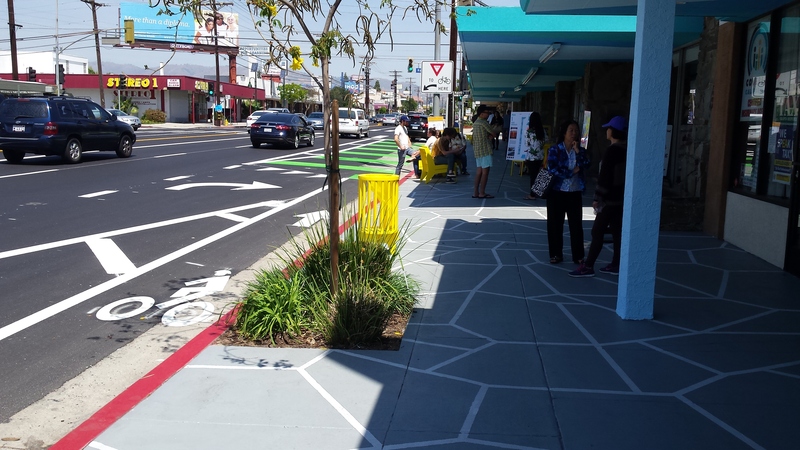 Once adopted, Mobility Plan 2035 will become part of the City’s General Plan and provide policy and implementation guidance for LA streets for the next 20 years. Mobility Plan 2035 is getting ready for a green light! Mobility Plan 2035 is especially dynamic and groundbreaking in that it represents the first time Complete Streets policies and guidance will be reflected in the City’s General Plan! Complete Streets are considered streets that provide safe access for all users. Mobility Plan 2035 includes a Complete Streets Design Guide that provides decision makers, departments, and the broader community a number of options for public rights of way (streets!) to achieve safe mobility access for people of all ages and abilities. Next Tuesday August 4th at 2:30pm the LA City Council Transportation and Planning and Land Use Management Committees will consider the decision to adopt the the Mobility Plan 2035, the key planning document for mobility and streets in the City of Los Angeles. If the Committees vote to adopt the Plan, then the Plan will be heard at full City Council for final Plan adoption, the last step in the adoption process! Mobility Plan 2035 provides a vision of integrated transportation networks for all road users. The Plan especially focuses on safe, low stress networks that encourage more people to embrace modes of active transportation, whether it be biking, walking, strolling, rollerblading, skating or more. The plan also establishes objectives to measure success, including objectives to decrease transportation-related fatalities; establish slow school zones; provide frequent, reliable on-time bus arrival; increase vehicular travel time reliability; expand bicycle ridership; expand access to shared-use vehicles; share real time information to inform travel choices; and increase economic productivity by lowering the overall cost of travel. If Mobility Plan 2035 is achieved, it would take 219,000 trips off of our roads every day, and result in 1.7 million fewer miles traveled every day, which would be great for our health, our commute, and the health of our environment! Full implementation of the Plan would triple the number of Los Angeles residents living within a quarter mile of a Transit Enhanced Network (TEN) facility and would more than double the number of jobs located within a quarter mile of such transit facilities. Don’t forget, on Tuesday, August 4th, the LA City Council Transportation and Planning and Land Use Management Committees will consider the decision to adopt the Mobility Plan 2035 at 2:30pm in Council Chambers. The meeting is open to the public and speaker cards will be available for those who wish to comment. /wp-content/uploads/2015/07/19321545170_8ee6513552.jpg 374 500 LADOT Bike Blog http://bike.lacity.org/wp-content/uploads/2015/04/tempBikeLogo2.jpg LADOT Bike Blog2015-07-31 16:03:312016-03-19 23:41:50Our mobility future is upon us! Plan for 2035! 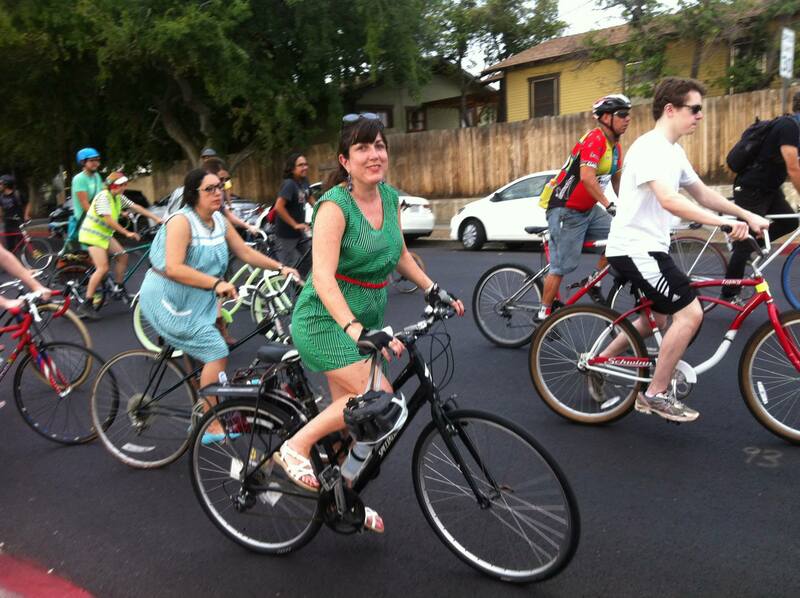 Our Senior Bicycle Coordinator, Michelle Mowery, tests a protected bikeway on Rosemead Boulevard in Temple City. By next year there will be statewide standards for this type of facility that physically separates cars and bicycles on the roadway. In September 2014, Governor Jerry Brown signed into law A.B. 1193. This law, known as the Protected Bikeways Act of 2014, requires the California Department of Transportation, Caltrans, to establish a new category of bikeway in the state’s Highway Design Manual, the technical design guide that governs bikeway treatment statewide. Currently there are three categories of bikeways – Class I bike paths, Class II bike lanes, Class III bike routes – and A.B. 1193 calls for the addition Class IV cycle tracks, or separated bikeways. Cycle tracks are common in Northern Europe but there are only a handful of such bikeways in California, and part of the reason is because of the absence of formal guidance at the state level. However, where separated bikeways (facilities that physically protect bicycle users from motor vehicle traffic) are implemented, they have been wildly successful and attracted a wider range of users! In May, Caltrans met with a broad coalition of bicycle advocates and local transportation agencies to discuss cycle track designs to hear some initial feedback as the design process for Class IV cycle tracks is being initiated. The LADOT Bike Blog visited the Valley yesterday to give you a first-hand look at the freshly refurbished Brown’s Creek Bicycle Path. The 1.6 mile path picks up where the Orange Line Bicycle Path terminates at the Chatsworth Metrolink Station, off of Lassen St. From there, the path travels north along Brown’s Canyon Wash, through quiet neighborhoods, past small pocket parks, murals, and resting ponies (no, really) before ending just north of Rinaldi Street near Stoney Point Park. In October, we announced that the path would be undergoing major repair work. Since then, the entire path has been covered with new asphalt including portions where overgrown tree roots caused serious damage to the pavement. In the near future, LADOT will add additional path signage and gates at access points to prevent motor vehicles from entering the path. During our visit, with the December sun shining and repair work complete, the path looked as good as new. A bright mural greets path users. Meet our updated online Bicycle Map and Bikeway Projects page! The Bicycle Program has been working on an update to our Bikeways Map on BicycleLA.org. In addition to our regular updates that keep the Bikeways Map accurate as new bikeways are installed, we’ve recently added new features to make the map more user-friendly and informative than ever. We’re using new colors to show the different bikeway types. New Legend and Map Colors: Traditionally, the map has displayed all bikeways in Los Angeles, using different colors to distinguish between paths, lanes, routes, and sharrowed routes. Now, we’ve adjusted the old color scheme to make it easier for readers to distinguish between the different types of bikeways. Bicycle paths are shown in green, bicycle lanes in red, bicycle routes appear blue, sharrowed bicycle routes are a pink-magenta, and bicycle friendly streets are a light blue. /wp-content/uploads/2013/12/11056196245_aa9a592211.jpg 500 495 LADOT Bike Blog http://bike.lacity.org/wp-content/uploads/2015/04/tempBikeLogo2.jpg LADOT Bike Blog2013-12-05 13:10:222016-04-11 21:09:41Meet our updated online Bicycle Map and Bikeway Projects page! 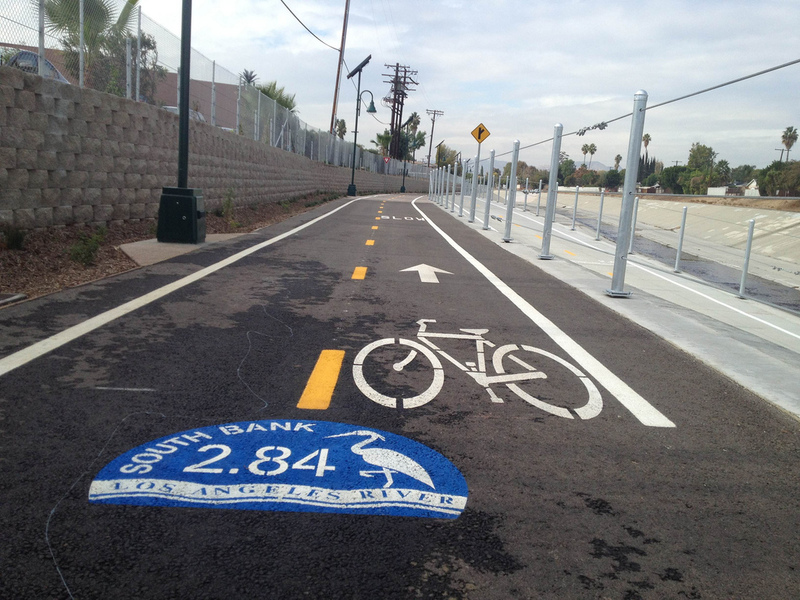 This West Valley segment of the LA River Bicycle Path was completed this year. We noted our major bike accomplishments in our FY 2013 annual report (data through April 28, 2013) but I wanted to take the opportunity to give our stakeholders the final tally. * Data note: Some of the current figures vary slightly from past reporting and reflect database clean-up.